Here are the Top 10 posts for June according to Google Analytics. He shot the film almost entirely on eight soundstages at Pinewood Toronto Studios; the scale of the production was massive. “We built parts of the robots, and the only thing that would fit in the largest stage in North America was the feet,” he said. He came to direct “Pacific Rim” only after two other efforts fell apart. 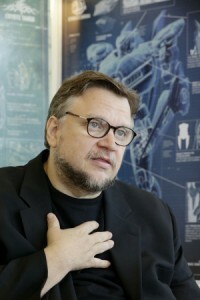 First, he had set out to direct a two-part adaptation of J.R.R. Tolkien’s “The Hobbit,” which ultimately became a trilogy helmed by Peter Jackson. Then there was his long-held passion project, a big-budget adaptation of “At the Mountains of Madness” by H.P. Lovecraft. The story of a scientific expedition to Antarctica that uncovers ancient life-forms collapsed after Universal declined to finance the film, a $150-million R-rated 3-D horror epic. Three new clips of interest to fans have been posted on CBS’ Sunday Morning website. The first minute of Passages pays tribute to the late Richard Matheson. And there are two segments of Anthony Mason’s interview of Stephen King. In one, the horror writer and executive producer of Under the Dome takes Mason on a tour of the set. In the other, King answers questions about his writing and career, and explains why he pulled his novel Rage out of circulation. The motion to expel Theodore Beale (“Vox Day”) awaits SFWA’s new board, which takes office July 1. Will they simply look at Beale’s tweets and posts, consider them in light of SFWA’s Bylaws, and give a quick thumbs-up or –down? Likelier they’ll start by comparing the case with any other disciplinary precedents in SFWA history. Followers of professional sports know that inconsistent discipline often leads to lawsuits if a player believes the suspension he’s received for some violation is disproportionate to the penalty handed down for the same infraction in the past. Other writers’ organizations kick out people when necessary, but SFWA, in forty-two years of existence, has never had the gumption to police itself. Members have lied and swindled and cheated, and yet SFWA has never expelled anyone, has never refused membership to anyone who had the necessary credentials. The lone example of SFWA discipline that seems to be public knowledge is the very incident that triggered Watt-Evans’ complaint and his departure, SFWA’s decision to censure rather than expel David Moles. In 2006, after Harlan Ellison groped Connie Willis onstage during the Hugo Awards ceremony, Moles became upset with colleagues he felt were defending Ellison in a private SFWA newsgroup. He made some of their comments public on his blog. (These appear to have been taken down, but related material Moles excerpted from public blogs and forums is still available at his old blog.) He wrote at the time, “I did not post those quotes lightly. This is not just another internet slapfight,” sounding like he considered his actions a variety of civil disobedience for which he expected and accepted certain consequences. Even today, censure is not provided for in the SFWA Bylaws, only expulsion, which makes one wonder how it worked. However, I recall that the Los Angeles Science Fantasy Society years ago voted to censure a member in lieu of expulsion, a procedure not explicitly provided for in its by-laws or standing rules. The members decided such an action could be authorized by a general vote. SFWA obviously came up with a rationale of its own for imposing another type of discipline on Moles short of expulsion. The Moles episode may have been on Beale’s mind judging by the way he introduced certain quotations from his own SFWA Forum posts on his personal blog. It was another way of baiting his colleagues. The Amal El-Mohtar motion, on the other hand, doesn’t dwell on such technicalities, it goes straight to the heart of the matter. 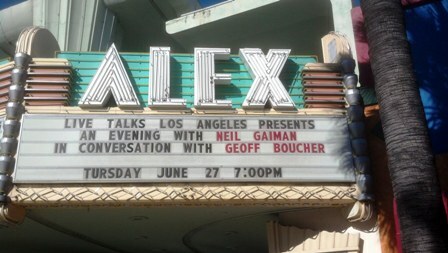 Neil Gaiman appeared at the Alex Theatre in Glendale, CA on Thursday evening. People began lining up for good seats six hours before showtime. 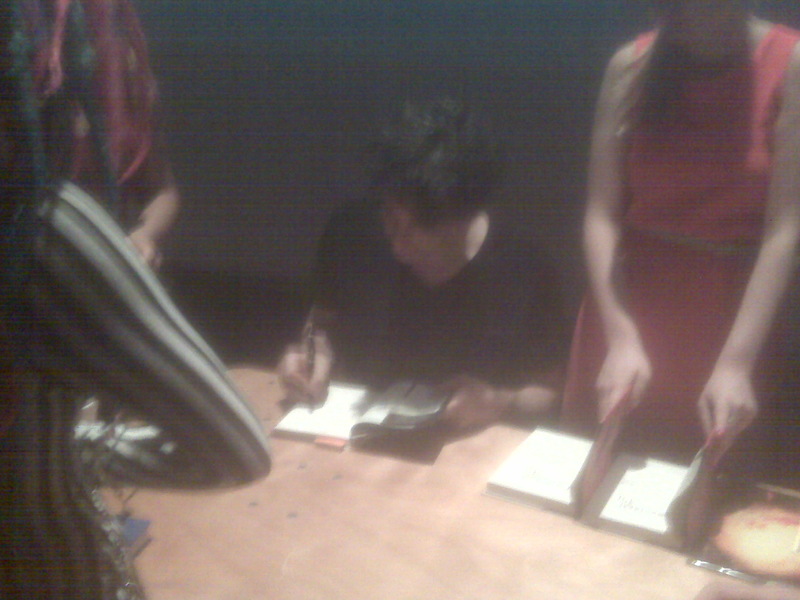 The photo below was taken over twelve hours later, at 1:54 a.m., while Gaiman was busy graciously signing everything put in front of him. Whether it’s blurry because a fan took it with his cell phone, or just reflects how everyone felt after a marathon day, is for a poet to decide. Pat Cadigan shared in her LiveJournal on June 27 that she has been diagnosed with cancer. Well, I’m not comparing myself to Jay Lake or Iain Banks. I don’t have that many fans and, more to the point, I’m nowhere near terminal. My doctor tells me that removal of the offending parts will no doubt be the end of the matter and five years from now I can probably forget I ever had a problem. But I gotta tell you, hearing the doctor tell me I had cancer was like being pole-axed. Over forty years ago, I was one of the anti-war demonstrators in the Mayday riots in Washington, DC. A policeman hit me with a billy-club. It was like that: blam! Pat, however many fans you have (which is quite a few) I’m one and I hope you beat this thing. 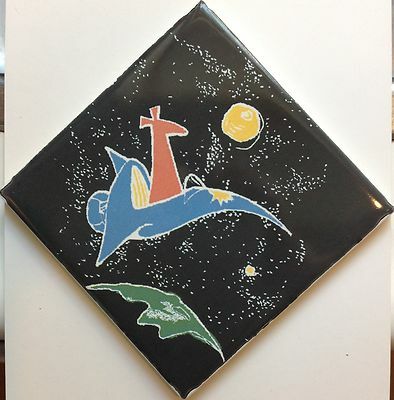 An iconic example of Arthur “ATom” Thomson’s fan art on a “new decorative wall tile” is up for auction on eBay, with the proceeds going to the Down Under Fan Fund. The tile is 4-1/4 inches a side, 1/4 inch thick. I believe “new” indicates the tile was made by someone besides ATom, using his art. ATom was a British fanartist whose work is identified with the classic fanzine Hyphen and was sought by faneds everywhere. He won the TransAtlantic Fan Fund in 1964 and his visit to U.S. is chronicled in ATom Abroad. He was a five-time Hugo nominee and received the Rotsler Award, posthumously, in 2000. The tile is a donation from Edd Vick and Amy Thomson. Sassafrass, an a capella singing group, will present “Sundown: Whispers of Ragnarok” at LoneStarCon 3 on Saturday, August 31. Gods and myths of the Viking era will come to life in songs that narrate the history of the cosmos according to Viking legend, from the creation of the world to Ragnarok. 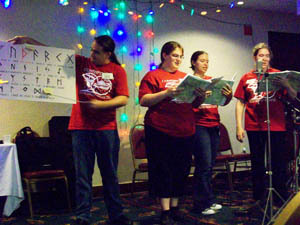 The song cycle premiered at Balticon earlier this year. This remarkable group recently raised over $16,000 through Kickstarter to fund both the Worldcon appearance and creation of CD and DVD versions of their Norse myth song cycle. WarGames came out 30 years ago this month, the movie where Matthew Broderick’s character thought he’d hacked his way into a game and nearly set off World War III. As I wrote last week, [Broderick’s] room featured an IMSAI 8080 microcomputer, with an IMSAI FDC-2 dual 8-inch floppy drive, an IMSAI IKB-1 intelligent keyboard and an IMSAI (in actuality a Cermetek) 212A modem. He discovered that the fellow who supplied the system for the movie, Todd Fischer, still has nearly all the pieces. There’d been a plan to auction it in London at Christie’s two years ago, but Fischer pulled out for various reasons. However, he wouldn’t mind selling it now for five or six figures. Fischer also has created an extensive website and written thousands of words of technical neepery about the WarGames computers. Lots of pictures there, too. And for the rest of you internet connoisseurs, he’s included a chunk of verbal abuse from a Hollywood type who disliked being publicly corrected by Fischer about some details of the film’s history.